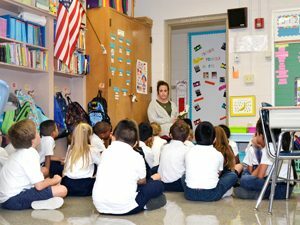 St. Cecilia Catholic School serves students in Kindergarten through Grade 8. St. Cecilia adheres to the directives of the Office of Catholic Education at the Roman Catholic Diocese of Columbus with regard to admissions. We strongly encourage all parents who are considering enrolling their child/ren at St. Cecilia to schedule a school visit. Please contact the school office at 614-878-3555 to make arrangements to tour our school, meet with staff, and learn more about how St. Cecilia can best serve your family's needs. St. Cecilia also conducts an Open House during Catholic Schools Week to give interested families an opportunity to explore our campus and meet with our principal, teachers, staff and families in a casual setting. These events are advertised on our website and in the Catholic Times.